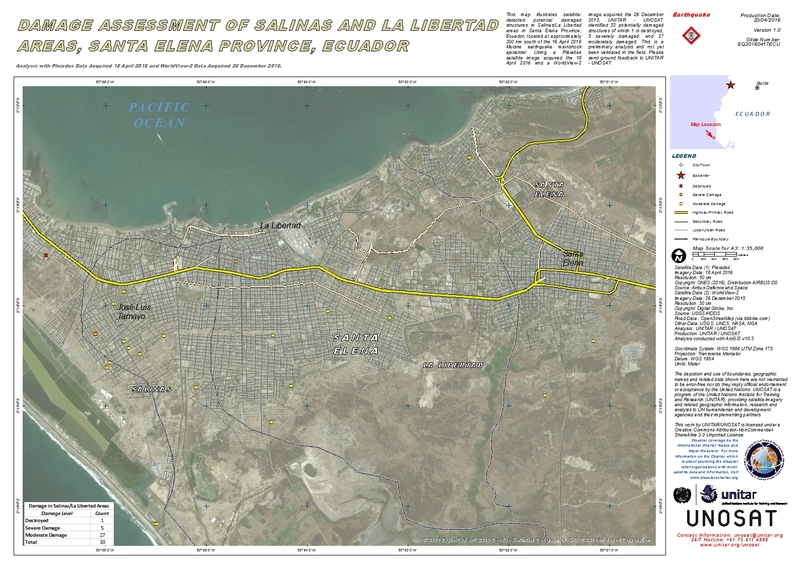 This map illustrates satellite-detected potential damaged structures in Salinas/La Libertad areas in Santa Elena Province, Ecuador, located at approximately 300 km south of the 16 April 2016 Muisne earthquake mainshock epicenter. Using a Pléiades satellite image acquired the 18 April 2016 and a WorldView-2 image acquired the 26 December 2015, UNITAR - UNOSAT identified 33 potentially damaged structures of which 1 is destroyed, 5 severely damaged, and 27 moderately damaged. This is a preliminary analysis and not yet been validated in the field. Please send ground feedback to UNITAR - UNOSAT.